When I see what appears to be strange, unexplainable or dysfunctional behavior I’ll often flip the “blue” lens in place or maybe I need to add the “red” lens to the mix so that I can see a deeper image. The point is that with the right lens we can see and understand behavior and dynamics in most situations. But what happens when you don’t have the right lens or haven’t developed the lens you need to understand a particular situation? There are too many times during a team meeting, especially a team under the stress of making a right decision during difficult conditions. when in a whisper or a side conversation I’ll hear someone say “What a jerk.” Nobody intends to be a Jerk. No one is sitting there trying to think about how royally could they screw up this decision making process. There not being a jerk, they’re just looking like a jerk through your lens. Try flipping down your “blue” lens to see how a particular temperament might react or behave in this situation. Maybe it begins to look more normal and understandable and not look like being a jerk. Still doesn’t explain all the behavior? Try flipping down your “red” lens to see how that temperament might behave under extreme pressure or maybe add the “green” lens to see what happens when that particular temperament finally hits the breaking point. Now that may not excuse the behavior but it sure explains it and helps us figure out how to support our colleague through these pressure moments. 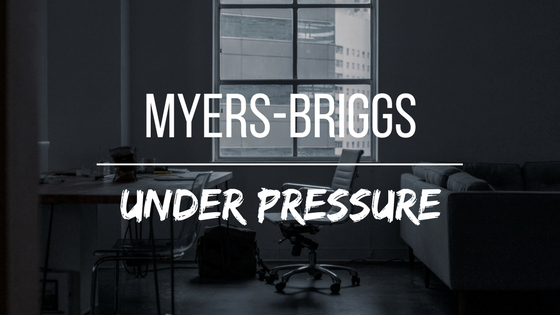 I’m going to start a series titled “Myers-Briggs Under Pressure” to talk about those moments when it seems like someone is being a jerk but in reality they’re simply performing in a manner that any person of their temperament type might behave under similar circumstances. Help you develop new lenses to see behavior in a new way and not write it off simply as someone being a jerk. Give you new tools to help team dynamics improve overall. Prevent the breaking points when someone reacts in a way that makes it difficult to recover even with the best of efforts. Hopefully we’ll change those opportunities from “Under Pressure” to “Withstanding Pressure” and here’s a healthier way to work that adds value to both the individuals and the whole team. Can you Ignore the Obvious?